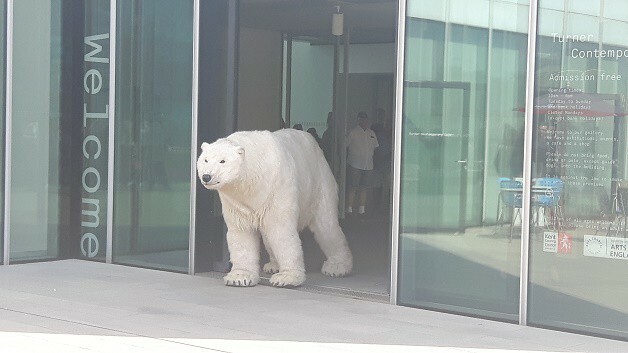 Paula the Polar Bear has arrived in Margate and taken her first walk on to the terrace at Turner Contemporary. 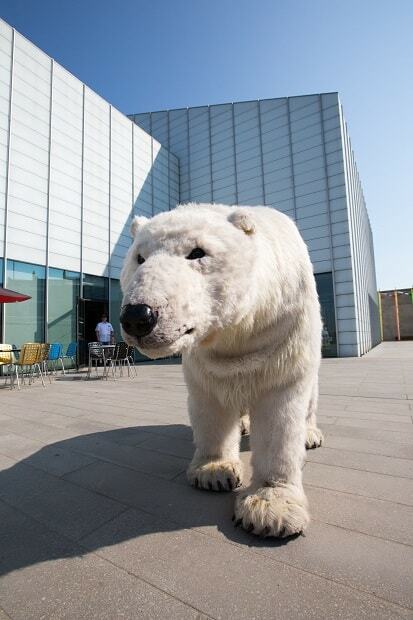 Taking the gallery’s Animals & Us show out of Turner Contemporary, Paula, a life-sized puppet, will wander through the town, sparking thought provoking conversations about climate change and how humans can co-exist with animals. 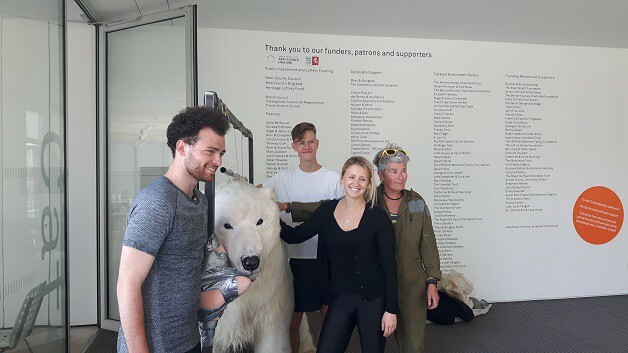 Paula the Polar Bear is on the isle thanks to the support of 292 funders who donated to Turner Contemporary’s first ever crowdfunding campaign via Art Happens, Art Fund’s crowdfunding platform. 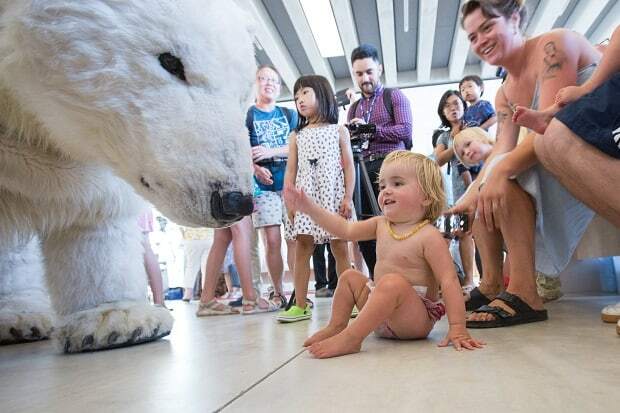 With Margate’s beach as the backdrop, Turner Contemporary navigators will accompany Paula, breaking the ice with conversation starters about climate change. 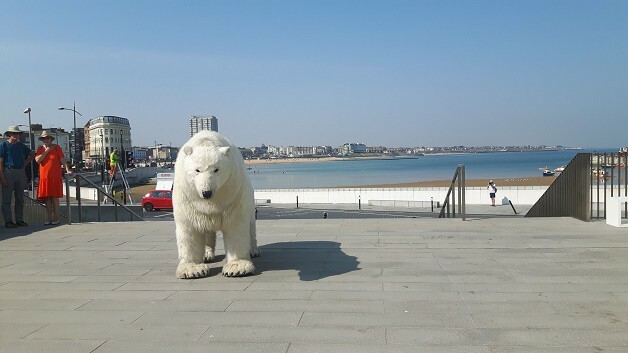 It will be the first – and possibly last – time that a Polar Bear has been seen in Margate. The bear is controlled by two volunteers inside the heavy costume, working under walkie talkie direction. Animals & Us is a major exhibition exploring artists’ reflections on the relationship between humans and other animals. The exhibition focuses on contemporary and 20th century art with select historical artworks, new works and commissions. 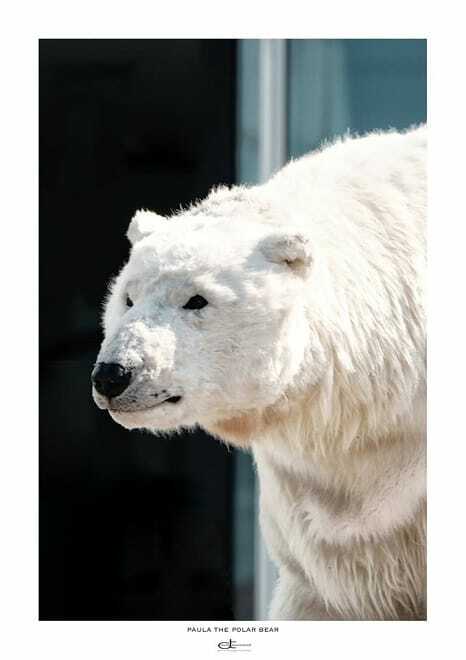 It comes at a time when around 38% of all known species are on the verge of extinction. With the death of Sudan, the last male northern white rhinoceros, Animals & Us is a re-examination by over 40 artists of how humans coexist and connect with other living species.